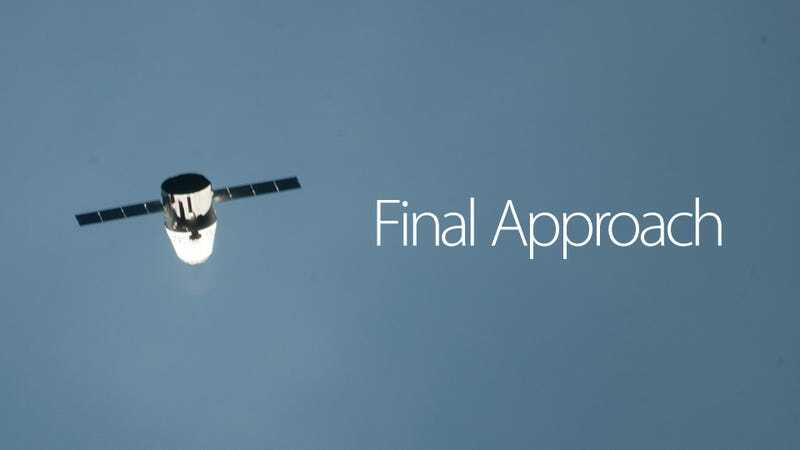 For those tuning in a little late to the story, SpaceX is the first commercial company in to attempt to send a spacecraft to the station. Ever. Only the governments of four very large countries – the United States, Russia, Japan and the European Space Agency – have ever accomplished this. Since the shuttle program's retirement, NASA has relied on primarily on Russian crafts (like the Soyuz capsules) for transporting goods (not to mention astronauts) to and from the ISS. If today goes well, that could all change. Just to be clear, this Dragon capsule is unmanned. The design of this one would primarily be used for resupply missions, but that's a very critical element of what NASA does. Them astronauts gotta eat. Currently the capsule is within 30 meters of the ISS and is closing in. Here's a picture tweeted by Space X when it was at 70 meters, taken from the ISS. We'll keep updating as it gets closer. 9:54amIt's half a meter away! Oh man, oh man, just grab it already! 9:56am Capture complete! "Houston station we've got us a dragon by the tail." Astronaut Don Pettit (one of our faves) has successfully used the ISS' robotic arm (the Canadarm2) to capture the Dragon capsule. Here you can see the Dragon capsule at the end of the ISS's long robotic arm. 10:10am Don Pettit just got clearance to begin installation procedures of the Dragon X into the ISS's Harmony node. From here on out, it should be a relatively smooth process. They are currently inspecting the Dragon capsule for damage using high powered binoculars as well as remote cameras. So far it's looking good for installation. NASA is ordering an attitude adjustment maneuver for the ISS before installation can be completed, but fingers crossed, it should be smooth sailing from here. Huge congratulations to Space X, NASA, and the space industry as a whole. It's truly a monumental day. 11:03am The station's Canadarm2 has moved the Dragon near the Harmony node to its "preinstall position". Here you can see a close up of the Dragon's hatch, looking all 2001: a Space Odyssey. 11:54am Entering the final stage of capture. "Smooshing," I think it's called. 12:08am Done deal! The Dragon spacecraft is now firmly attached to its berthing port on the Harmony module. Huge congratulations again. Great day for all concerned.